On Monday 4th February 2019, the Dwingeloo telescope downloaded a new photo of Earth and the lunar farside. 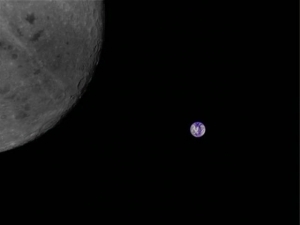 This photo, taken Sunday 3rd February 2019 at 15:20 UTC, shows the lunar farside and Earth (with South America in view). The lunar farside has more visible craters than the side of the Moon which faces Earth. This photo was taken by the Chinese satellite LongJiang 2 in a lunar orbit. One of the devices on this satellite was made by students from the Chinese Harbin Institute of Technology. They put a (relatively) simple webcam on it that can take pictures on command. These photos are then sent to Earth with a little antenna. Because the satellite is so far away, receiving the signal requires a large radio antenna. The Chinese have asked the CAMRAS volunteers at the Dwingeloo Radio Telescope to help with this. Downloading this photo from the satellite to the Dwingeloo Telescope (16 KB in size) took 20 minutes. 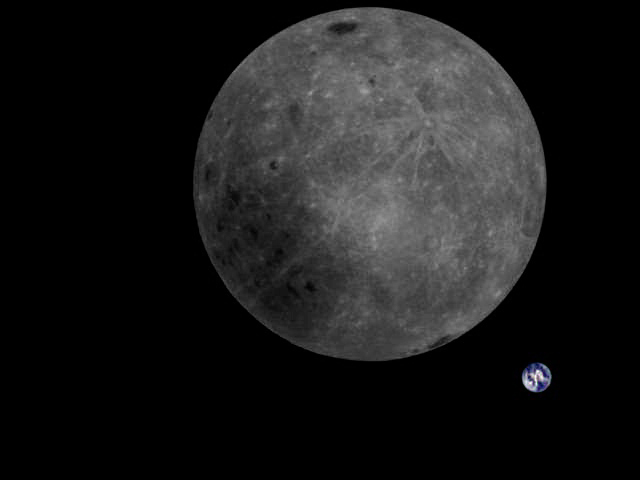 The little Chinese satellite that took this photo has been in lunar orbit since the beginning of 2018. It ‘took a ride’ on the rocket that launched the bigger QueQiao satellite. That satellite also hosts antennas from ASTRON, the original owner and professional neighbour of the Dwingeloo Radio Telescope. ASTRON hopes to use the antennas on the big satellite to receive signals from just after the Big Bang as part of the Netherlands-China Low-frequency Explorer (NCLE) project. The amateur radio payload that took this picture was developed at the Harbin Institute of Technology by Mingchuan Wei (BG2BHC), Hu Chaoran (BG2CRY), Tai Mier (KG5TEP), Zhao Yuhao (BG2DGR). Taking this photo was coordinated by Wei. 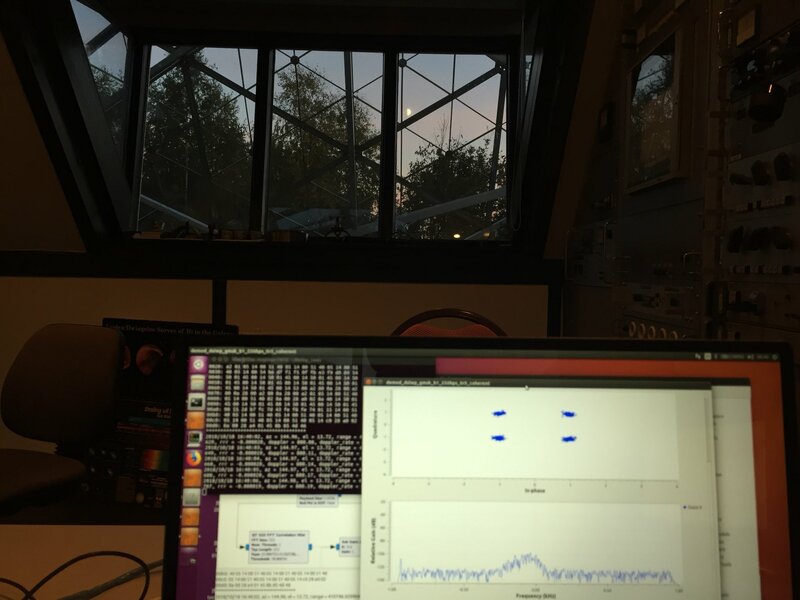 While downloading this picture, the CAMRAS Dwingeloo Radio Telescope was operated by Cees Bassa, Tammo Jan Dijkema and Vanessa Moss. The commands were uplinked to the satellite by German radio amateur Reinhard Kuehn (DK5LA) with his home-built yagi array. See more details in blog post Our precious Earth and the lunar far side. The photo has been color-corrected. Since the satellite camera lacks an infrared filter, colors come out too red. The original is below; we edited it to balance the colors, and make the Moon greyscale. In October 2018, the Dwingeloo Telescope also cooperated in receiving a lunar farside photo (see blog post Our precious Earth and the lunar far side) and even a time-lapse showing the Earth disappear behind the Moon (see blog post Time-laps of the Earth appearing behind the Moon). At that time, the satellite was closer to the Moon, so the entire Moon did not fit in the picture. In the next months, we expect to receive more of these photos. But in August 2019, this adventure will end: then LongJiang 2 will crash in a controlled manner onto the lunar surface in a controlled manner. QueQiao will continue operating for the foreseeable future. 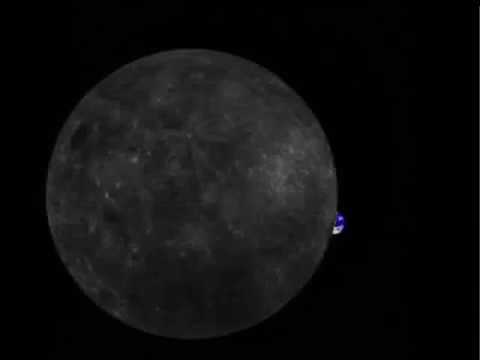 On October 7, 2018, the Chinese lunar satellite DSLWP-B made this 1.5 hour time-lapse of the Earth appearing behind the Moon. An international team of radio amateurs and amateur astronomers downloaded the images with the Dwingeloo Radio Telescope. The team consisted of MingChuan Wei (BG2BHC), Reinhard Kuehn (DK5LA), Daniel Estévez (EA4GPZ/M0HXM), Tammo Jan Dijkema, Cees Bassa, Paul Boven (PE1NUT) and even more team members were involved. Click on the picture to see the time-lapse. Tammo Jan Dijkema gave a short explanation about this project in the Dwingeloo Radio Telescope for the local TV station RtvDrenthe Dwingeloo-telescoop ontvangt maanfoto’s (in Dutch). 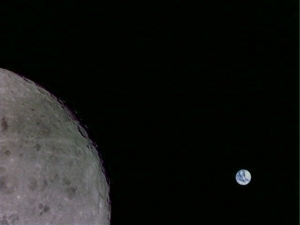 For more info about this project see our earlier blog Our precious Earth and the lunar far side. scheme designed by radio amateur and Nobel prize winning astrophysicist Joe Taylor (K1JT) for weak signal Moon bounce experiments. Besides telemetry, we performed a VLBI experiment by simultaneously observing Longjiang-2 from China and Dwingeloo, and also downloaded images taken by Longjiang-2 of the lunar surface, lens flares, and the starry sky as seen from lunar orbit. 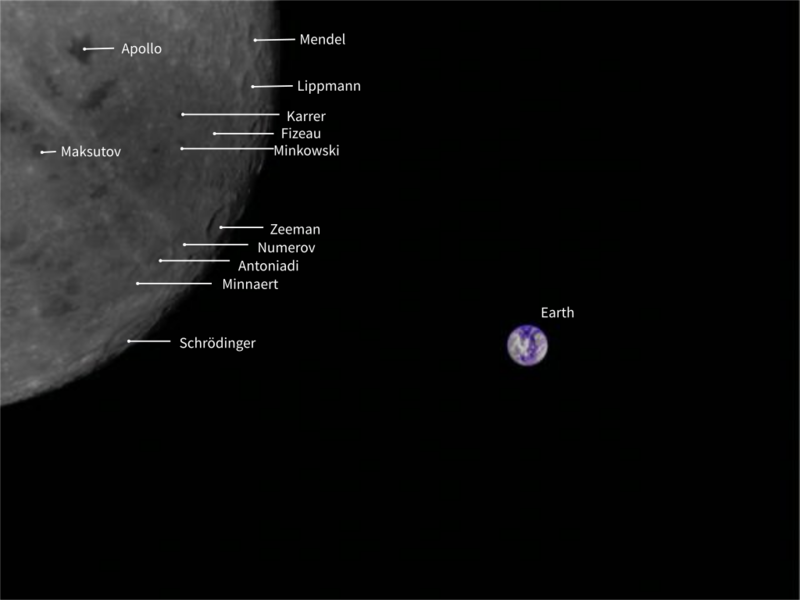 The annotated picture with names of Moon craters is made by Tammo Jan. Note that the crater Minnaert is named after the Dutch astronomer Marcel Minnaert. Minnaert was member of the SRZM board in the time the Dwingeloo Radio Telescope was designed and build. Below are two other images, also slightly color corrected. The original images are here. The third image shows the Moon clearly seen from Dwingeloo Radio Telescope through the window of the observation room and the metal mesh of the mirror. 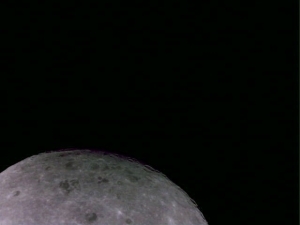 The animation below shows the Moon as seen from the DSLWP-B satellite as it orbits around the Moon. The animation pictures were taken on October 15. Data for the animation was collected by Cees Bassa and Tammo Jan Dijkema in the Dwingeloo Telescope (PI9CAM), by Imants Tukleris (YL3CT), Mike Rupprecht (DK3WN), and Dimitry Borzenko (4Z5CP). The satellite was commanded by Reinhard Kuehn (DK5LA). About this experiment, Cees Bassa and Tammo Jan Dijkema wrote a slightly more detailed blog Imaging the Earth from Lunar orbit in The Planetary Society. Find more recent technical info at Twitter @PI9CAM. A more recent animation is on our newer blog Time-lapse of the Earth appearing behind the Moon. 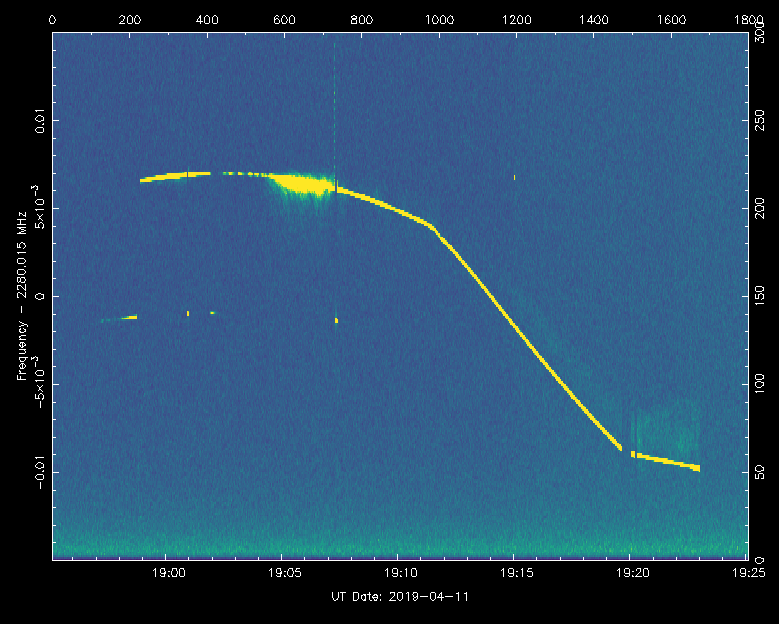 After a radio-quiet period to avoid interfering with the Chang’e 4 Lunar landing, DSLWP-B became active again on 13 January 2019. The first opportunity to take photos of Earth and Moon were on 3 February, on which a command was sent to take another timelapse. The first image from this timelapse was downloaded with the Dwingeloo telescope on February 4, 2019. For the first time, it the entire Moon and Earth are in view. 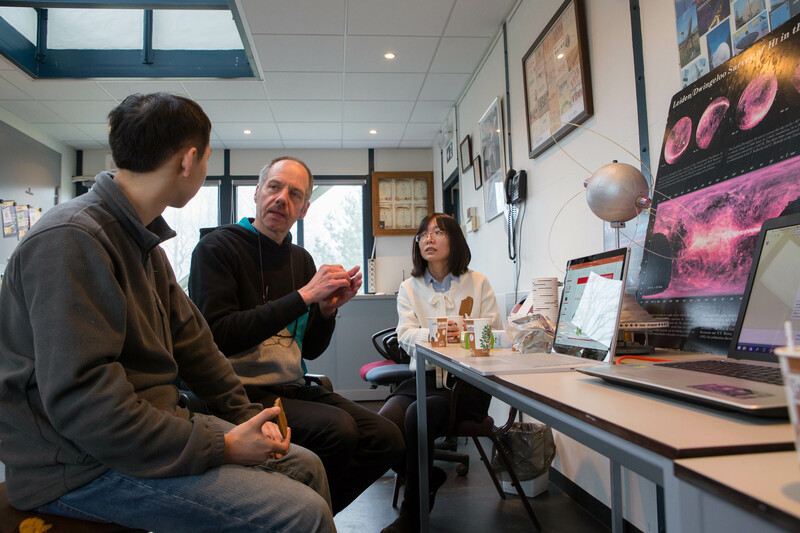 December 2017, in preparation for the mission and discussion of the possibilities of the antennas and receivers in the radio telescope, Hu Chaoran (BG2CRY) and MingChuan Wei (BG2BHC) both of the Harbin Institute of Technology visited Harry Keizer (PE1CHQ) and Jan van Muijlwijk (PA3FXB) of CAMRAS. 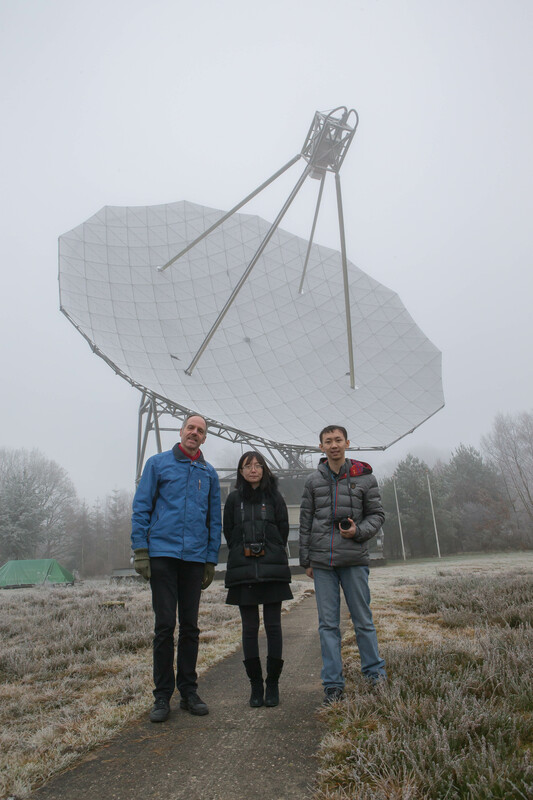 On the photo in front of the Dwingeloo Radio Telescope to the left Jan, in the middle Chaoran, and to the right Wei. In fact the Dwingeloo dish is transparent metal mesh, but on this winter photo covered with snow. In ‘Echoes of Apollo’, (http://echoesofapollo.com/ the URL refers to the web archive of the no longer existing website) – a worldwide commemoration of the Apollo 11 Moon landing forty years ago – radio amateurs in the Dwingeloo Radio Telescope sent a radio speech to the Moon on June 27, 2009. During the Moon landing of the Apollo 11 forty years ago, radio telescopes played a crucial role in the communication between the astronauts and the home base. During the commemoration, communication specialists and radio amateurs exchanged messages via the Moon with large parabolic antennas. The broadcast from Dwingeloo was provided by radio amateur Jan van Muijlwijk (PA3FXB), one of the dozens of volunteers who help restore the radio telescope in Dwingeloo. Under the call sign PI9CAM, he honored all the astronauts who have been on the Moon by reading their names. His speech was broadcast by the radio telescope to the Moon in a radio message. The Moon reflected part of the emitted radio waves back to the Earth. In that part of the world which was turned to the Moon, one could listen to his rebound speech. Worldwide, youth was also involved in this commemoration. From Switzerland, America, and Australia, they could let their voices travel to the Moon and hear their echoes three seconds later. This delay is caused by the large distance (385,000 km) between the Earth and the Moon. A few days earlier, the New York Times published a short article A Ham Radio Weekend for Talking to the Moon about this. During this commemoration, it turned out for the first time that with extraordinarily small transmission capacities (of less than a hundredth Watt) worldwide reliable radio connections can be realized by using the Moon as a reflector for radio waves. 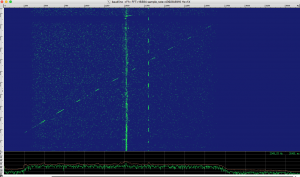 Herewith, the radio telescopes of Dwingeloo and Mount Pleasant (Tasmania) were used. The text below was read by Jan van Muijlwijk to Tasmania via the Moon. Recordings were made in Dwingeloo (audio) and in Tasmania (on video). Together with RTVDrenthe, Jan van Muijlwijk made a video impression of this broadcast combined with images of the moon landing on July 20, 2019. 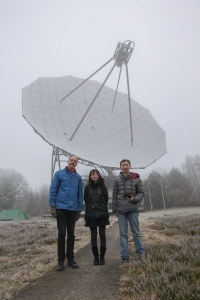 Since January 2007, the CAMRAS foundation (with its volunteers and donors) has been working on renovating the Dwingeloo Radio Telescope and making it usable again in order to stimulate the interest in science and technology among young people.